I have had to take some unexpected time off work due to illness and cabin fever is setting in. So I've decided to set myself a challenge - do one crafty or creative thing each day for the next 30 days and blog about it! 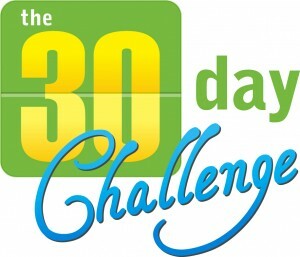 :) The 30 day creativity challenge! So hopefully over the next 30 days this will focus me to use my free time productively and try out new recipes, make some crafty projects, learn how to use my SLR camera and learn how to blog! And I'll finally make some things from pinterest. And maybe somebody will find my little blog and read along or, even better, join me in my challenge! So what now? Well seeing as I've celebrated this milestone by creating my very own Being Inspired blog button I'm guessing I'm not going anywhere. Time for a new challenge though. Any suggestions? ?